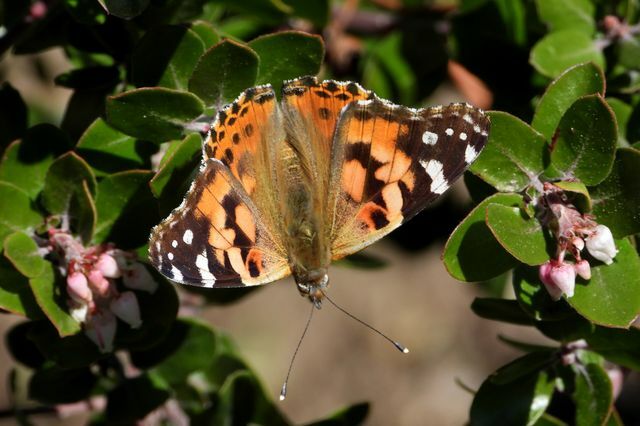 A painted lady butterfly taking a rest in UCLA’s Mildred E. Mathias Botanical Garden during a mass migration in 2019. You’ve seen the butterflies fluttering across Los Angeles and speeding through campus. You’re likely to see them for another couple of weeks, according to research scientist Jeff Holmquist, a community ecologist at the UCLA White Mountain Research Center and the UCLA Institute of the Environment and Sustainability. Holmquist explained in an interview why there are so many butterflies this year and why he’s betting on this species despite climate change. He also clarifies that the migration has nothing to do with the wildflower super bloom, and why that yellow splat on your windshield is the same thing that helps the butterflies make their migration — and what makes butterflies a nutritious snack. Where are these butterflies coming from? These are painted lady butterflies. They have a famous migration pattern. They winter in various places in northern Mexico and Southern California like the Mojave Desert. They prefer open habitat like desert, sage growth and meadows. Why are we seeing so many in Los Angeles right now? The big migration years seem to be in wet years, when there’s a lot of food for the caterpillars. Big rain years like the one we just had are just huge for the forage plants that they eat. So the female will lay individual eggs on plants, and they hatch in about 5 to 7 days. The caterpillars just eat and eat for a few days, then make a chrysalis. I’ve been studying invertebrates my whole career, and butterflies are just extraordinary. To reorganize the body like that takes a huge amount of energy. You may as well imagine eating like crazy for a week, crawling into a sleeping bag for a few weeks, and coming out as an eagle. They’re flying north where it’s temperate to lay eggs. Do they migrate every year? Normally we see a few here, a few there, but yes, there’s always a migration. They’re very fast fliers. They can go about 20 miles per hour, and they’ve been clocked at 25. If I can maintain about 25 miles per hour on my bike, I can fly along with the butterfly flight. It’s quite fun. I’m looking forward to the migration making it north where I am in a few weeks. They also have a return migration that tends to be at high altitude. There’s some mystery there, because it’s really unknown by scientists how frequently they migrate at high altitude. We may be missing some of the picture because they fly quite high. Are they attracted by the super bloom of wildflowers in Southern California right now? It’s more that they fly at the same time that flowers bloom. As you’ve seen, they’re on a mission. They’re not stopping to feed. Right now, they’re living on their fat reserves. They’re very good at turning their food into energy in the form of lipids — that is, fat. They have to take a backpack full of food, essentially, to make this migration, and for them that’s an abdomen full of fat. If you see them hit your windshield, you’ll see that yellow splat, and that’s the lipids. Fat reserves are very important for a lot of insects, and that’s part of why many societies are rediscovering them as food right now, or have traditionally eaten them. Butterflies are very fatty. I’ve heard of insects as high-protein, but not fatty. Oh yeah, they’re like little chicharrones. I have a project going right now with our local Paiute tribe, and butterflies are an important traditional Native American food. The Paiute use a different species, but they catch the caterpillars, then roast, salt and boil them, and they preserve very well throughout the year. Is the change in this year’s migration related to climate change? My sense is that over time we can expect to see earlier migrations, as the climate warms. I’m not sure this year’s is early, though. And there’s the unknown factor of rain. A lot of butterfly booms are cyclical, but this one is really driven by rains. In a year with more rain, we would anticipate another large migration. Are there other ways that climate change could interfere with painted ladies? It’s possible. They might get too hot earlier. But I wouldn’t bet against the painted lady. It’s probably the world’s most widely distributed butterfly, living everywhere but South America and Antarctica. It’s very well-adapted. There’s a very large migration in Eurasia that’s even more striking than what we have right now, and one that goes from the Sahara to England. A lot of species are very specific in their choice of host plants, but painted ladies aren’t picky. They’re real generalists. They eat lots of thistles, sage, sunflower and mallow plants. So they’re fine. But we’re in danger of losing so many other species. As long as people have butterflies on the brain right now, what can they do to support butterflies and biodiversity? Plant some milkweed. While painted ladies eat lots of plants, monarch butterflies need milkweed. People need to plant the native northern milkweed — the southern, more tropical milkweeds don’t have the same seasonal cycle, and that may remove an important migration cue for monarchs. Other than that, any good nectar plants are good for a butterfly garden. For painted ladies, maybe slow down a little if you see them while you’re driving. I brake for butterflies. But that may not be the thing to do on the freeway. Any other advice about the migration? Enjoy it. This is nature’s fireworks display.